The future of finance is automated apps that analyze your accounts and know how much to save and spend. Managing money is something few Americans learn about in school—if you did, you were one of the lucky ones—but it’s a fact of adult life we all have to figure out eventually, ideally before collection agencies and the IRS are beating down your door. But even if you make enough money to pay your rent or mortgage, bills, student loans, car payments and other obligations, you’re probably not doing a great job of saving any leftovers. This is where the iOS app Digit comes in. It just might change your life. Digit launched last year as an SMS bot that you connect to your checking account. The sophisticated software behind the bot analyzes your income and expenditures and starts socking away money in a savings account. Digit saves small amounts every couple days, ones you wouldn’t really notice, but they add up. The company just released an iOS app (and a convenient Apple Watch glance) that makes your progress more visible. You can still use SMS to text commands to Digit, but the app offers a handy commands menu with shortcuts for checking your balance, viewing recent purchases, and withdrawing money. Think of the SMS bot as the banker, and the app as the bank, where you can pop in to check your balance and tinker with your settings. And the app is taking off: Since its launch last month, around 20 percent of users are opening it every day. Digit isn’t actually a bank. 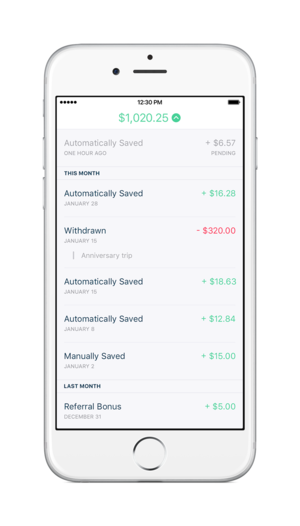 Your savings in the app don’t earn interest—although banks are offering paltry interest earnings anyway—though you do earn “bonuses,” which are 20 percent of the interest that Digit makes by placing your money in a custodial account. Digit keeps 80 percent of that interest, which is its only revenue stream, for now. CEO Ethan Bloch told me he has no interest in turning the service into a bank. But Digit is planning to go beyond the savings account. Bloch told me the company is testing integration with credit cards and student loans. Digit will use that data to determine how much debt you can afford to pay down each month. There are a few regulatory hurdles the company has to jump through to offer those services, so Bloch told me those integrations won’t happen until the fourth quarter of this year or later. Digit works best for people who use their checking account for all of their purchases, from cups of coffee to bills, so the service has all of the granular data it needs to decide how much money you won’t miss. I’m giving Digit a try right now, though I put all my big and small purchases on a credit card I pay off every month to rack up rewards. The company says it can still reasonably estimate how much money to save without seeing that credit card activity, so I’m giving it a shot. 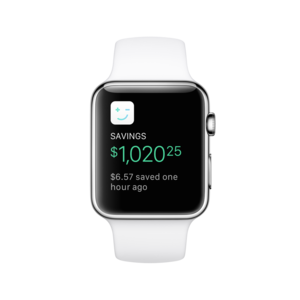 There is no evidence that using an app like Digit to save money is more effective than going it alone, but based on anecdotal data like savings amounts and withdrawal times, Bloch thinks Digit’s approach has been successful. The company has saved more than $101 million since its launch last year, so clearly something is working. Depending on how many people are using Digit—a figure the company doesn’t disclose—that number could be impressive. According to a December 2015 survey, 56 percent of Americans have less than $1,000 in savings (not including retirement accounts). And despite being a chatbot-turned-app, Digit appeals to more than just the Snapchat generation. Bloch says about half of the service’s users can be defined as millennials, while 22 percent are in the 35–44 age bracket. Younger folks are skeptical of banks in the wake of the financial crisis, but they’re not alone. 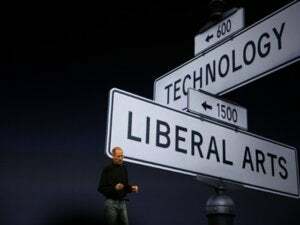 He pointed to the success of Airbnb and Uber, which turned crazy acts like crashing on a stranger’s couch and getting a ride from someone you’ve never met into normal behavior. Right now, Digit is working on ways to expand its messaging capabilities. Even tech giants like Facebook and Microsoft are betting big on chatbots, with occasionally disastrous results. If the future is automated money management, with bots that pay my bills and apps that save money for me, then I’m all for it.